In 1966, the then agricultural minister, Fred Peart, officially opened the giant Leez farm reservoirs scheme near Great Leighs, Essex. He congratulated Lord Rayleigh’s Farm for recognising the need for water conservation and taking the bold step of constructing the two sixteen acre, 100 million gallon lakes. Since then, these waters have been in the sole custodianship of the Essex Fly Fishers’ Club, which has provided excellent sport for generations of keen trout anglers. Our club operates a strict limit on member numbers, to ensure that on each visit, every fisherman has the freedom to roam a chosen lake without ever feeling crowded. Its aims are to promote a friendly, yet informal association of like-minded members with a passion for the art of fly fishing. A purpose-built wooden lodge clubhouse is available for the convenience of members and guests to sign in, hire boats and register their session catches. Tea and coffee making facilities are provided. Available for members and/or guests at both lakes. 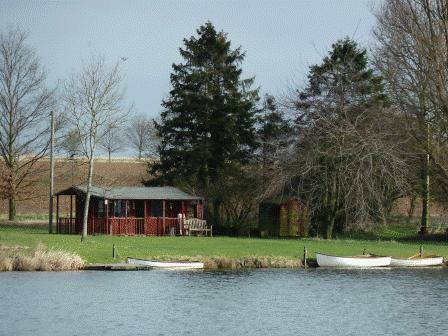 Hard standing is situated adjacent to the Clubhouse for anglers on Lodge lake, and a short slip road allows anglers to drive their cars to a parking area close to Lavender lake. Four boats are available for use on both lakes. In general, these can be taken as required, but can also be booked in advance. The fees for their use are shown here..
A toilet is available at each lake.